We need to do everything we can to protect the source drinking water in WSSC's Patuxent reservoirs, Triadelphia and Rocky Gorge, not only for our current customers but for future generations. 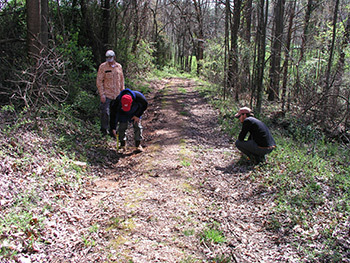 And that means doing the best job we can to manage our portion of the buffer land around them – the WSSC watershed. A review of our watershed regulations and policies has been long overdue. That’s why WSSC engaged EA Engineering (EA) to begin a multi-phase study that will show us better ways to protect the WSSC reservoirs watershed buffer while working with all stakeholders, including recreational users and our customers. The watershed protection study will provide a scientific basis for enhancing and optimizing management of the WSSC reservoirs watershed buffer land to better protect and improve water quality of the Triadelphia and Rocky Gorge reservoirs and their sustainability as source drinking water for our customers. EA Engineering is conducting a phased-study that began with the portion of the watershed land buffer that WSSC owns and controls and hopefully will later expand with the cooperation and support of partner agencies and local governments to the entire Patuxent River drainage basin. The consultant is providing an independent assessment of current WSSC watershed buffer land conditions and the impacts caused by public access and recreational uses. The consultant’s engineers will confirm desktop data on watershed boundaries and the condition of recreation areas, access roads and trails. This will involve the consultant’s staff walking or driving on the trails and using GPS receivers to verify trail locations on existing maps and adding related observations regarding sources of pollution. The consultant has conducted field reconnaissance of the WSSC watershed buffer land to photo document existing and potential erosion of public access areas, authorized and unauthorized trails, access roads, recreation areas, and sections of shoreline with existing or high erosion potential. 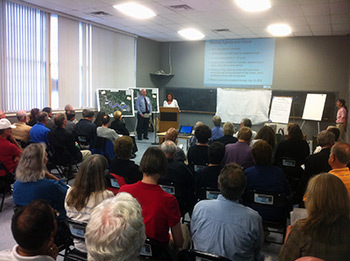 Presentation 2012 (pdf) - Here is the EA presentation made at both public meetings. Recording problems during the June 18th meeting reduced the accuracy of the transcript of what was said during EA’s PowerPoint, but the content was essentially the same at both meetings. Approximately 86 people attended, including representatives of WSSC. After a brief presentation by EA, more than two dozen residents raised their concerns about the watershed and the study. The second public information meeting was held at the Izaak Walton League Wildlife Achievement Chapter with approximately 44 people in attendance. Again, stakeholders had the opportunity to share their concerns about current watershed regulations and how they hoped the watershed would be used in the future. Attendees - EA asked residents who attended the meeting to provide their name, affiliation, if any and contact information. In the interest of privacy, we have redacted the contact information. Attendees - A list of attendees provided with contact information omitted out of respect for privacy. Transcript - June 18, 2012 - The meeting was recorded on audio tape, then transcribed and edited for spelling and accuracy. Transcript - June 19, 2012 - The meeting was not recorded on audio tape but transcribed by a professional. Written Comments - The public was invited to submit written comments through July 19, 2012.